The EUROCOM Panther 5 Mobile Supercomputer supports 12 core Intel Xeon or Intel Core i7 processors, 32 GB DDR3-1600 memory, 6 TB storage and dual MXM 3.0b NVIDIA GeForce, Quadro or AMD Radeon graphics, making it the most capable Mobile Workstation for mobile analytics applications. The EUROCOM Panther 5 is an enterprise class system for professionals creating, studying and manipulating sensitive data, because of this security is essential. Eurocom equipped the Panther 5 with a Trusted Platform Module 1.2 (TPM), finger print reader and Kensington lock port to provide them with the utmost in secure computing to keep their information, intellectual property and livelihood safe and secure. A complete line of optional 6, 8 and 12 core Intel Xeon E5 2600 V2 Processors, based on the LGA 2011 processor socket are also available. The top of the line Intel Xeon E5-2697 v2 has 12 cores, 24 threads, 30 MB of L3 cache, running at 2.7 GHz, supports Intel vPro Technology, Intel Virtualization Technology, Intel Hyper-Threading Technology and Intel Virtualization Technology for I/O. The supported 4 and 6 core processors consist of the Intel Core i7-4960X, I7-4930K, 4820K, 4th generation processors built upon the 22 nm architecture and running at up to 4 GHz. The Intel Core i7-4000 family is the perfect engine for power users who demand unrivaled performance in data and financial analysis, 3D modeling and gaming. The large 15 MB L3 cache and quad channel memory interface of the Panther 5 are especially beneficial when running heavily threaded applications. Since analytics can require extensive computation, the algorithms and software used for analytics harness the most current methods in computer science, statistics, and mathematics. 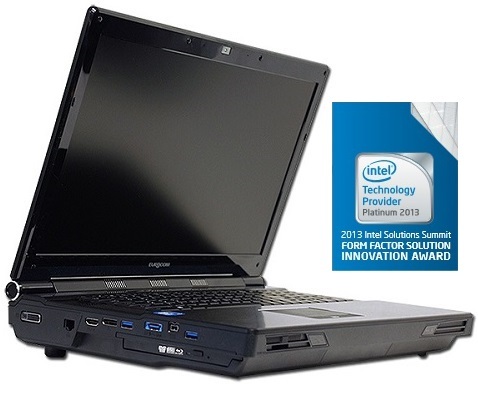 One of the few solutions with the processing power required for such a task, due to the LGA 2011 CPU and Intel X79 chipset which is able to support 12 core Intel Xeon E5-2600 v2 as well as Intel Core i7 processors, is the Panther 5 from Eurocom. With such capability in quite a mobile form factor, with so much custom options the EUROCOM Panther can fulfill a wide range of applications. For network, storage and server managers like Gregory Carter, from Applied Engineering Software Group, the Panther combines the perfect combination of capability and mobility, as explained by Gregory himself. “The analytic, software development, infrastructure management work I do on the server, storage and network problems many of my customers have require simulation study. So I used to haul around a desktop class system and run many of my own tool sets for identifying customer problems in that machine. It became a pain to haul around 80 pounds of hear with me. When I saw an X79 chipset in a laptop that could run an Intel Xeon class server processor, I decided to have a look at the Panther 5SE. I found the machine could run all of the tool sets I use just as well as the desktop server machine I used to haul around.” Gregory Carter, AESGI. Financial Institutions are utilizing the Panther 5 for data mining, trend analysis, portfolio analysis and forecasting, while Engineering companies are using the Panther 5 for scientific computing, rendering and visualization, and Medical Institutes are using the EUROCOM Panther 5 for medical image analysis. “We are seeing a great deal of interest from professional as well as amateur players looking for a machine for mobile chess analysis. In Chess analysis, essentially all that matters is node speed, which is measured in kn/sec and the EUROCOM Panther, equipped with a 12 core Intel processor is the ultimate solution for the ultimate strategic analyst.” Mark Bialic, Eurocom President.